What If Kerry Fraser Wasn't Blind? If you follow me on Twitter, you know I love those new NHL ads for the Stanley Cup playoffs. The two I've been seeing lately ask What if Bobby didn't fly? and What if Mario wasn't super? Here they are. I never get tired of watching them. What If Bobby Didn't Fly? What If Mario Wasn't Super? About three hours ago, after watching the Bobby Orr ad again, I tweeted my prediction as to what will be the third in the series. 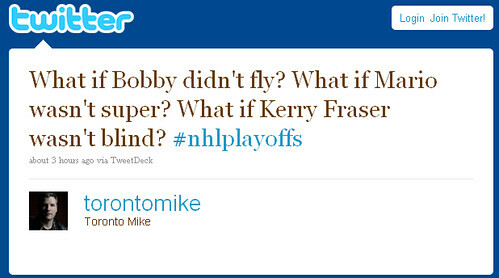 I predicted it would ask "What if Kerry Fraser wasn't blind?" It seems fellow Barilkospherian General Borschevsky had the same idea, tossed it over the wall to Bloge Salming, who made that third ad for the NHL. I agree Mike, I love these spots. NHL marketing always is bang on (I still get chills with the Patrick Kane one "Is this the year" from last year). I think there's supposed to be six of these coming out, it'll be interesting to see the other four.